There are some places in Kyoto where I've never visited. Even Kyoto is my home town and I've been here for more than 20 years. To be honest, I didn't really know about my city untill I began to work here. I'm still learning Kyoto though. On my day off recently, I went to Sanzenin in Ohara which is very famous temple and also one of the places I've never visited. Ohara is a little far away from center city. It takes 45 min. by bus. 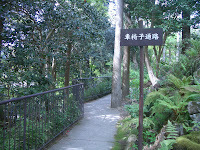 When I got there, I was impressed by full of nature. It was so relaxhing! Sanzenin is 10 min. away from the bus stop. Entrance fee is JPY700. This is a little expensive but you will forget it once entering the temple. I find that moss shoud grow more. It's still brown but still amazing. 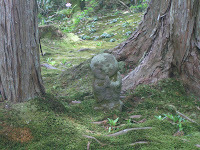 There are few jizo (a stone statue) in the garden. Jizo is generally said budda protecting children. Isn't it cute? This temple is wheelchair accessible. There are pathes for wheelchair with no steps elsewhere. Cherry blossoms are gone but some flowers are blooming. If you have enogh time, I highly recommend Sanzenin. I will definitely come back again in autumn. I can't wait! I had dango at the end of visit. Dango is Japanese sweets kind of dumpling. 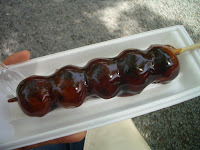 The one I had is called mitarashi dango dipped in sauce with suger and soy sauce. Then I remembered I was surprised that I found a MUJI store in Milan when I went to Italy. MUJI seems to be getting popular in some European countries. Come to think of it, recently UNIQULO has opened New York Soho store. UNIQULO is a Japanese casual clothes store and offers clothese at good price. I haven't been asked where is UNIQULO store yet and I don't know how popular it is in US though... There are also some branches in Europe, so it could be getting popular like MUJI. MUJI's items are quite simple and it's been popular for long time. UNIQULO is popular from young to old generation in Japan because of the price and its design. There are big MUJI and UNIQULO close to NISHIYAMA RYOKAN. Check them out if you come! Cherry blossoms are almost gone but green leaves are growing and it is perfect weather to sightseeing now. 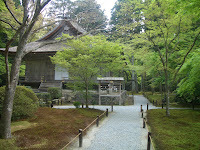 I went to Kamigamo shrine which is located in Northan part of Kyoto. 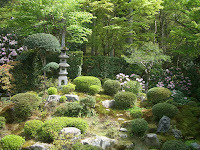 Kamigamo shirne is registered as World Cultural Heritage site in recognition of its importance as a monument of ancient Kyoto. 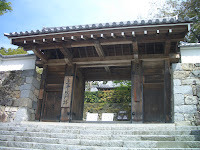 This red gateway is seen at shrines. It indicates that the area inside of the gateway is scared space. This shrine is not really well known but if you have enough time in Kyoto, why don't you visit there? 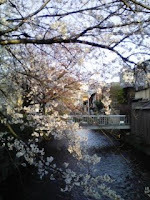 There are cherry trees called shidare sakura. Shidare means droop and literally branches are drooping. Shidare sakura blooms little bit later than cherry trees we can see normally in beginning of April. There is beautiful stream in this shrine. During summer time, we can see hotaru (firefly) here. Fireflies can be seen at only natural river or stream. They used to be seen at many places but today they can be seen at only a few places because of pollution. I wish we could protect them in years. It's been very warm since begining of this week. Finally, finally I feel spring has come! Cherry blossoms make Kyoto city more beautiful everywhere. 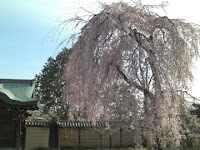 This huge cherry tree is in Kodaiji temple located in Gion area. If you are here during cherry blossom season, I'm sure you won't be bored to walk around. There are many places you have to visit both during daytime and nighttime. The thing is that it is hardly predicted when flowers come out. Even if you decide to travel Kyoto, nobody knows the best time for cherry blossoms... So you can just cross your fingers! Cherrry blossoms are finally fully blooming! Meteorology agency predicted they bloom end of March. 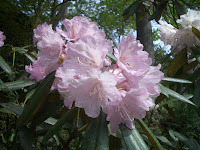 But, it suddenly got cold and it took time to fully bloom. You see? It is hard to forecast when cherry blossoms will come out. Yesterday, I went to Shirakawa street at Gion area. 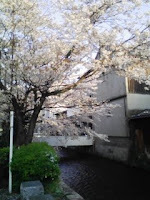 Now is the best time for cherry blossoms, so that it was very crawded. 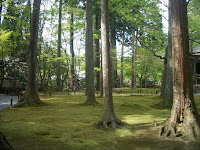 This area is the very place you can feel Kyoto. There are wodden houses beside the small river. At night time, lights are put in this area. This is the moment I feel happy to live in Kyoto!